NETWORK FINALS: The BLUE BLOODS rerun lost 0.1 in final numbers. CABLE HIGHLIGHTS: Discovery’s GOLD RUSH tied for the lead on Friday cable, down 0.03 to 0.69, with the lead-out WHITE WATER hour down 0.06 to 0.47. 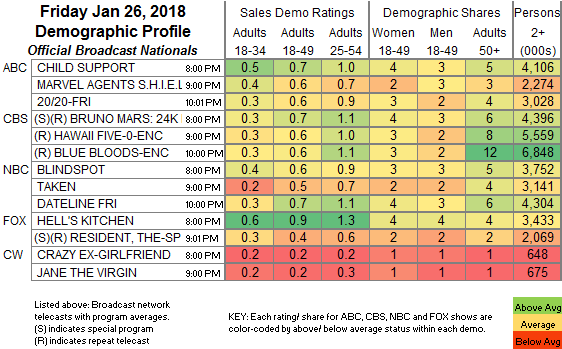 A&E’s LIVE PD was also at 0.69, up 0.05 from last Friday. ESPN’s NBA game was at 0.59, followed by X GAMES coverage at 0.32. On HBO, REAL TIME WITH BILL MAHER was steady at 0.42, and HIGH MAINTENANCE was steady at 0.12. Food Network’s DINERS, DRIVE-INS & DIVES rose 0.09 to 0.39, and GRILL DADS was up 0.05 to 0.27. On HGTV, MY LOTTERY DREAM HOUSE gained 0.04 to 0.35, HOUSE HUNTERS ticked up to 0.32, and HOUSE HUNTERS INTL held at 0.30. Bravo’s MARRIED TO MEDICINE climbed 0.03 to 0.33. MSNBC’s RACHEL MADDOW SHOW took the night in cable news at 0.31/0.45/2.6M, above Fox News’s HANNITY at 0.28/0.50/3.1M and CNN’s ANDERSON COOPER 360 at 0.23/0.35/1.1M. ID’s MARRIED WITH SECRETS grew by 0.03 to 0.31. Nickelodeon’s LOUD HOUSE fell a tenth to 0.30, and ADVENTURES OF KID DANGER was down 0.05 to 0.29. On Lifetime, THE RAP GAME dropped 0.05 to 0.29, and BRING IT was down 0.04 to 0.28. 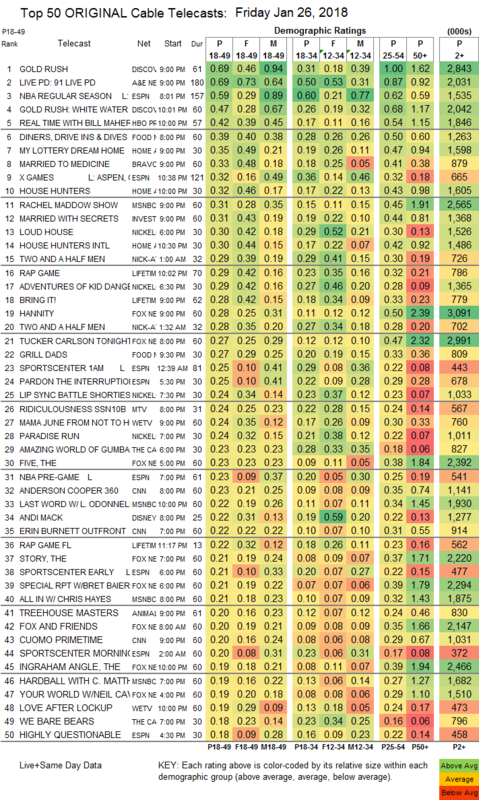 MTV’s RIDICULOUSNESS was at 0.24, compared to last week’s 0.36/0.29, and AMAZINGNESS was down 0.09 to 0.15. We’s MAMA JUNE: FROM NOT TO HOT gained 0.03 to 0.24. TLC’s UNTOLD STORIES OF THE ER ticked down to 0.18. Paramount’s BELLATOR LIVE was at 0.16. The final episodes of HBO’s MOSAIC were off the chart, both at 0.04 with 229K/189K total viewers.